/ Modified dec 17, 2014 7:58 a.m.
Kegs await shipping at Dragoon Brewery in Tucson. Beer has been called the common man’s drink, but the growth of the craft-beer industry in Arizona is anything but common for industry in the state. Big beer brewers such as Anheuser-Busch and Coors Brewing still dominate beer sales across the country, while local brewers have managed to find a chink in the armor of beer’s biggest producers. The numbers White quoted are from the Brewer’s Association’s report on 2013 craft-beer production in the United States. It shows that in 2013, the economic impact of craft brewing in Arizona was more than $650 million, up from $290 million in two years. What’s allowing such rapid growth in craft brewing in Arizona and around the country? Brewers point to the diversity and quality of beer produced in craft breweries. That can be seen in Tucson’s breweries, which often band together to share ingredients to work on special brews. Craft brewing, while growing, is still a small part of the beer industry. Anheuser Busch reports that it produced 132 million barrels of Budweiser and Bud Light in 2012. Craft beer produced about 15 million barrels nationally last year. 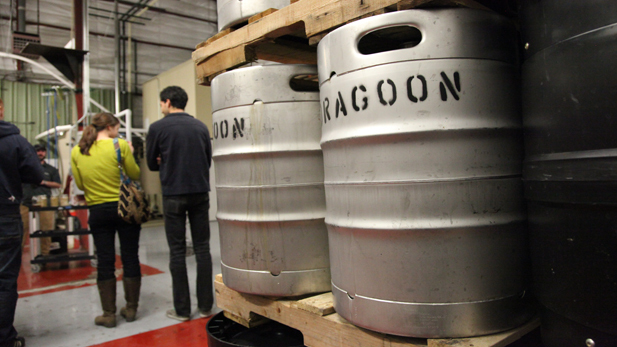 Arnold's Barrio Brewing, at 5,000 barrels, and Dragoon, at 1,600, were part of that.